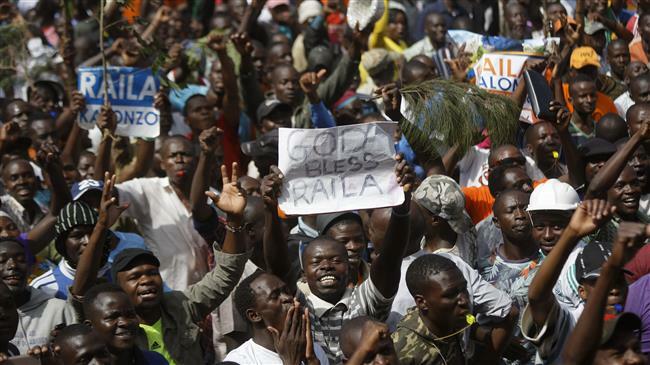 Nairobi(ANN)-Kenyan police on Saturday briefly detained another key government critic over his alleged involvement in the recent mock inauguration of opposition leader Raila Odinga as the “people’s president”, the third such arrest within four days. Aladwa is accused of helping to organize the January 30 symbolic swearing-in in Nairobi in front of tens of thousands of supporters, in a fresh challenge to President Uhuru Kenyatta’s re-election last year. “Aladwa is being investigated over what happened at Kalonzo’s home. He is also being questioned over the chaos in (Nairobi) where he mobilized youths,” police spokesman Charles Owino told AFP. Kenyatta’s victory in a re-run vote in October has sparked deadly clashes and polarized the country. “It is absurd that Mr. Odinga and his coalition members have chosen the path of confrontation… but the government’s reaction is equally revolting,” according to the paper. But Odinga’s inauguration has also alienated him from the international community, with Western diplomats saying they were not in contact with him.